The Memorial Stone commemorates commemorates 24 locals who served in World War One. This memorial honour stone has replaced the original Honour Board once located on the corner of Churchill and Cemetery Roads. The original Honour Board was unveiled in 1916. 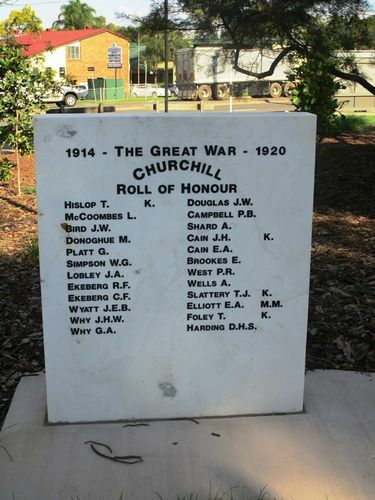 The Churchill and Loamside Honour Board erected at the corner of Churchill and Cemetery Roads, was unveiled on the 16th December 1916 by Mr. E. T. Bell, M.L.A. At the time of the unveiling the board contained 20 names. The Brisbane Courier, 19th December 1916.